Since 2012, Eco-Emballages has encouraged companies to display sorting instructions directly on packaging, a wish expressed by nearly 66% of consumers who are not always aware of the right thing to do. Because cosmetic products have their own constraints, Eco-Emballages and the FEBEA now provide companies in the sector with a practical guide to help them design and affix this instruction on their products. Packaging is the first information medium for consumers seeking information on sorting, recalls this guide in its preamble. To support its members in their awareness-raising efforts, Eco-Emballages provides them with a harmonised, ready-to-use sorting instruction: the Green Point Info-tri, already present on more than 25 billion packages. Because cosmetic products have their own constraints (pack size, strong brand image, international dimension, etc. 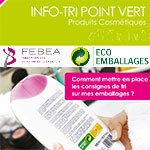 ), Eco-Emballages and the FEBEA support companies that choose Info-tri Point Vert to help them build and affix a sorting instruction on their products. This guide thus recalls the challenges of the Green Point Info-tri (an expectation of consumers, in financial interest with a bonus of 4 to 8% on the contribution to Eco-Emballages, an environmental commitment), and then provides practical answers to various questions for: - build a sorting instruction in four steps, - know how and where to affix the sorting instructions according to the specific constraints of each packaging, - find all the useful information and tools to put this instruction into practice. The materials that make up the packs being named on the packaging in order to facilitate sorting by consumers, the guide also proposes a table of designation of packaging, with the instructions associated with them.